After participating in the Stitch Up A Dress Challenge, I realized I could use more dresses and a few skirts. I checked my stash and... mmmm I just wasn't feeling what was there (does that happen to you, despite your best intentions of working with what ya' got). Well my first attempt at procuring some fresh fiber was at Joann's, but walked away with just 2 yards of pastel silky print. Raspberry fern print (cotton-poly), Emobriodered ivory (cotton), Brown/creme batik (rayon), Denim blue (linen), Joann's pastel silky print (poly), Embroidered white (cotton), Black textured polka dots (chiffon), Green floral print (cotton), & beige polka dot (home dec fabric) for a tote bag. The denim blue linen had just arrived the day I visited and only purchased 1-1/2yds for a skirt, but once I got home, realized I wanted more to make pants. Returned the next day for more... mmm yeah about that... all gone - I really wanted to pinch myself... Who in the dickens purchased 8-1/2yds. NowI can begin my dress/skirt frenzy. Oh please do not ask about my suit-a-month challenge.... well since you asked.... that has been pushed to the side. Most of the knits will be used for wrap dresses and the first haul of fabric will be used for B5147 and skirts. Leaving you with a Pic of B5147 Modified & in Action. Okay, you've convinced me to try fabric other than linen for the B5147 top. I can't wait to see your creations. The sight of your purchases took my breath away. Lovely fabric, you are in knit heaven. I'm inspired by your fabric purchases. I like everything and can't wait to see it all made up! LOL!! Oh my! You did go on a shopping binge :0 Love your knits You are so lucky that you have a store to purchase them. The only thing that we have here in Kentucky is Hancock Fabrics and Jo-anns. I found one piece of knit at Jo-anns yesterday and that was all they had other than a few ugly pieces left. Can't wait to see what you sew up! Yes, I am very envious of your purchases! 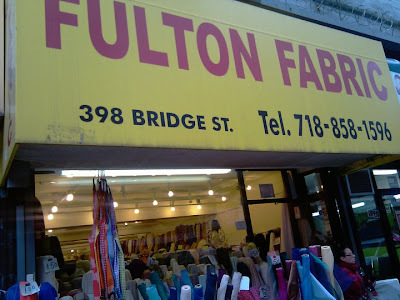 I don't live anywhere near a decent fabric store. 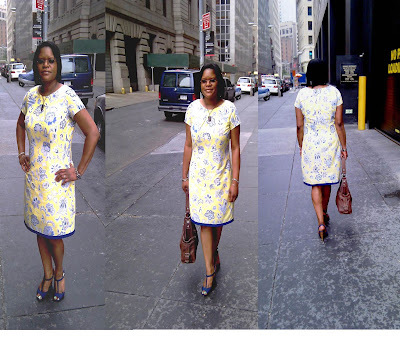 Your dress in action is perfect and the shoes with the hem give it that something special. Love it! Love the lootttt! Buying fabrics make me happyyyyyyyyyy! You've really got a gorgeous collection there. You make me think about my trip there last summer when you talked about carrying your large haul in that hot weather. OOOOOhh, to live near NY, I've got to make another trip someday. I can't wait to see what you do with that awesome haul!! Cab? Did someone mention a CAB in that 80+ heat!!! *LOL* Yeah, I can't wait to see these become garments! Gorgeous B5147. Why didn't you let me know you were here?!?!?!? Great fabrics. I have to settle for JoAnn's and Walmart fabrics. Great new fabric, can't wait to see your creations. Man oh man, I love the fabric ... all of it! I want to sew and I need the time! I'm in "busy season" at work and I can't make it on your 4 -5 hours of sleep. Correction ... others wouldn't survive if I only slept 4 -5 hours a night. LOL I'll find time to sew soon. I can't wait to see your new clothes! You are going to have a faabulous wardrobe of dresses and skirts now! Beautiful fabrics. I am sooooo envious!!!!! You have wonderful fabric stores near you! Especially Spandex House, I love knits and from the look of your goregous haul, it's worth a trip (vacation) to your "neck" of the woods!!!! I bet you're going to make up one heck of a wardrobe!!! Time to get sewing!!! Wow what a great haul! I remember those scorchers, tourists and running to 42nd in order to catch the Metro North going back to the boonies (weigh down by great fabrics of course!) Can't wait to see your magic! Wow, that's quite a haul! I can['t wait to see the sewing frenzy results! Lady, that's a whole lot of fabric (all gorgeous) to be lugging around in 80++ degree weather. I'm looking forward to the garments. 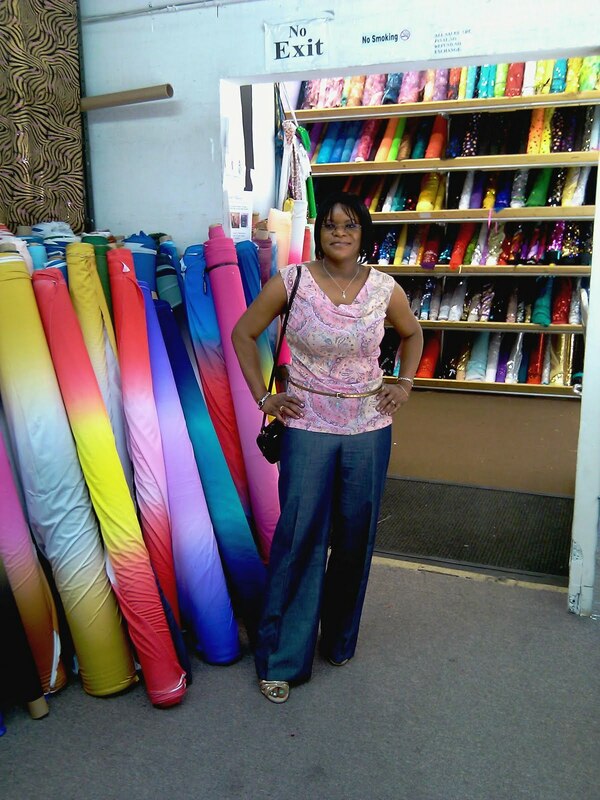 Wow, your fabrics are beautiful and I luv, luv, luv the slacks you have on. Why did I burst out laughing when I read that you thought you needed more dresses and skirts ? I don't know why that struck me as funny. P.S. The dress is a perfect fit. Good Lord, woman, where do you put all that fabric? So lucky to be next to such a store! Love the shoes that match the blue/purple in you dress - you remain a shoe guru.